German MG3 ratchet plate for your MG42, MG1, MG3 or Yugo M53 build. Hard to find part in uncut condition. As pictured these are taken off German receivers. As such they are not new. These are rough as there is no easy way to remove one from a demilled receiver. We remove these with as much care as possible, however it's not the easiest part to demill. Expect to do some straightening. Can be re-welded for a nice clean look. "great surplus part for building!" 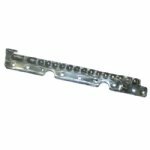 Product Review: This MG3 ratchet plate makes building much easier being it already has the slot and kick off hook for the charging handle. Some may need to be straightened a bit, but this is very easy to do.